When I have asked people this question, their responses have been both delightfully unique and predictably predictable. Freedom is time for travel, not having to work, doing whatever it is one wants to do, playing music, volunteering, not having to set an alarm clock every night, eating a limitless amount of cheescake and not gaining weight, experiencing no boundaries. . . Many people equate freedom with money. Financial freedom has its many perks that allow for choices that can be bought. Exotic travel, a newer car, a bigger home, a better body that has been nipped, tucked, and enhanced. A better wardrobe, more shoes, a bigger closet. But what about those many things in life that do not have a price tag? Like health, love, laughter, respect, integrity . . . many of the things that ask that an active and committed and mindful choice be made. Choices about the food we eat, how often we exercise, what kinds of supplements we want to add to our diet. Our choices to extend love, to share, to forgive someone their humanity – even when we truly do not even feel like it. Our choices to walk through the walls of our ego for a different view and laugh at ourselves and with others. Choices to not sell ourselves short too quickly for a short-term solution. Choices to believe that something wonderful is about to happen. Always . . . believe that something wonderful is about to happen. Choices to stay on the sunny side and to believe in optimistic outcomes. All of these choices . . . we have so much freedom to choose in any given second of any given day from an infinite library of perspectives. But I sometimes think that I tend to oversimplify . . . especially when I am writing at my old, favorite, beat-up library table with a fire going in the fireplace and a glass of white wine nearby. There is beautiful music playing and it is official: we are on the sunny side of winter solstice. I am blessed with so much and choices feel easier when life feels good. I read East of Eden by John Steinbeck many years ago. The idea of timshel is discussed – the Hebrew word for thou mayest. We are born with a sense of free will that allows us to make choices for better or for worse. Timshel is freedom of the mind, but isn’t it also freedom of the heart entwined with freedom of the mind? I am not sure how to separate the two. Which camefirst? The thought or the feeling? There are neuro-scientists and neuro-psychologists that can surely answer to this. There is amazing and impressive research concerning our emotional intelligence and what occurs during an emotional hijacking . . . how our emotional brain races ahead of our rational brain. Thoughts. Feelings. I am convinced that there is an additional element that blends and swirls with our thoughts and our feelings: timshel. We can accomplish many amazing things; we can meet many goals; we can overcome staggering obstacles. Amazing and stunning displays of success. But what came first? The Thought? The Feeling that motivates and drives us? Or the Freedom of Mind that opens the doors that allow our Thoughts and our Feelings to pass vigorously, creatively, and humbly into the worlds and dimensions around us? What is freedom? ” . . . the way is open . . .” Some definitions of freedom remove obligations but my current definition asks that I embrace responsibility for Freedom of Mind . . . for embracing timshel and understanding that thou mayest means different things to different people. Defining anything can introduce a wealth of confusion and possibly disagreement. Words, as wonderful and beautiful and elucidating as they can be, can also limit us in the ways of thou mayest – a blessing of optimism. 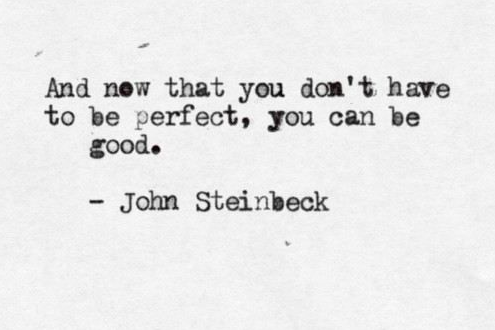 “Now that [we] don’t have to be perfect, [we] can be good.” Simply put . . . what is freedom? I believe that it is optimism. Always believing in the possibility that something beautiful has the power to enter into my world.